Paver is available as a consumable, for renting it per month(s) or as a service. If you like to rent it, please send us your preferred range of months and we will send a binding quote. Paver Consumable is a licensing option where you just pay for the data you really want to present. With this option the price of your visualization software scales with your project size. Paver is available as a consumable. 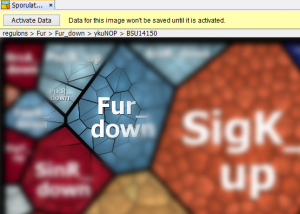 When having installed it, you see all data in the demo mode, i.e. the visualization can be reviewed partially by moving the mouse cursor while the remaining area is blurred. Furthermore, data is opened save-disabled. However, once you have purchased Consumable credits, you can activate your data for being able to save it and also to see the complete visualisation clearly. Already have an account with Consumable credits? Login and check the current balance and previous activations. Expression data from any field of OMICS technologies are mapped to gene functional classification systems and analyzed. New (customized) classification schemes of interest can be implemented if necessary. We process your data with respect to the hierarchy of your preference and deliver the Paver Viewer along with your data sets. Since each project is individual, pricing depends upon the number of different hierarchies you want to show and the number of data sets for each hierarchy. Please contact us using our contact form or email us. A sales representative will then call you back and ask for further details about your project, e.g. your preferred hierarchy, the quantitative data, and how they are linked with each other. You will then receive an individual binding quote. Of course we keep all data confidential.